On Saturday, a group of seven of us set out to summit Mt. San Jacinto, which is only at 10,850 feet elevation, but when you start on the desert floor at about 500 feet, this turns into a brutal day-hike, listed as the 5th toughest hike in America by Backpacker magazine. We started at about 5:30 AM, as the sun was rising above Palm Springs and I could feel the blanket of heat from the desert chasing us as we climbed up the steep trail starting behind the Palm Springs Art Museum. Most of the group hit the tram station at 10 miles, and after over 8,000 feet of vertical gain, they were done, an accomplishment in itself, and by far the toughest part of the hike. Jess, a notorious sandbagger and our guide up the trail, Renata, and I set out for the summit of Mt. 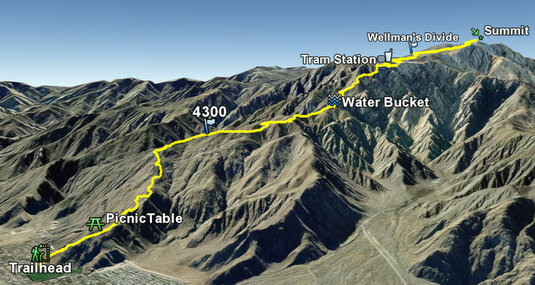 San Jacinto, a twelve mile round-trip from the tram station. It took us about four hours and we ran the last couple of miles. 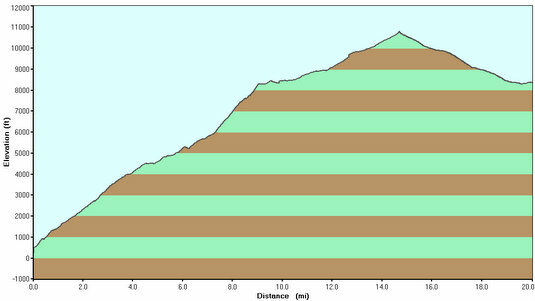 All told, the hike is just under 23 miles with over 11,000 feet of elevation gain. This really was a tale of two hikes, the first 11 miles of desert scrub and a never-ending climb to the tram station (the steepest vertical cable rise in the U.S., and second steepest in the world), and the second section of a pine-layered, shaded trail to the summit. It was a great and painful day with beautiful weather and amazing views. My wife proved to me, as she does daily, that strong women are beautiful as she struggled through exhaustion, pain and nausea to reach the tram station.